Anders Zorn: ”On the Beach S:t Ives Cornwall England”, 1888 (detail) . ”Fish Market in Saint Ives” – one of the artist's very best watercolors. The quote, taken from Tor Hedberg's biography from 1923 is merely one example of the praise that has been showered upon this masterpiece over a long period of time. Ernst Malmberg refers to it, in connection with the grand opening of the Liljevalchs public art gallery in Stockholm in 1916, as "one of Zorn's most exquisite watercolors" while the main authority on Zorn’s life and career Gerda Böethius, in her extensive book on the artist from 1949, describes how the piece "radiates a shimmer of inspiration and jolly mood". In more recent years, Hans Henrik Brummer has noted that "the generously flowing watercolor" is "a prime example" of Zorn's "inevitable intuition" as a watercolorist and continues: "There is also no doubt that Zorn performed a series of stylish watercolors in St. Ives, studies from the coast as well as the port. But his tour de force is definitely 'Fish Market in Saint Ives' “. The composition, which marks the peak of Zorn's masterful use of watercolor, was executed during his stay in the small fishing village of Saint Ives in Cornwall; which lasted from December 1887 to March 1888. The three months in Saint Ives proved vital for Zorn's artistic development, since it was here that he found the time to summarize his achievements as a painter up until then. Birgitta Sandström has pointed out how Zorn's depictions of water from this period are executed in a freely held but technically very advanced manner through which the artist seems to thrive on the artistic challenges generated by complex designs and motifs. Hans Henrik Brummer follows the same line of reasoning when he writes that Zorn as an artist always demonstrated great originality in his use of artistic materials. A contemporary testimony that backs up the above mentioned is provided by Zorn's American colleague Edward Simmons who witnessed the birth of the watercolor. Simmons recalled how Zorn drenched the paper in water – bucketloads of it. When a sudden rain shower made the paper wetter still, Zorn said: "Now I can make a fine picture". The motif proved ideal for exercises of this kind. Here was a wet and sandy beach where the artist could capture traces of the busy marketers' activities. But, according to Zorn himself, the focal point of the picture was the woman in the foreground. In his autobiographical notes the artist writes the following: "One day I saw inside a house an of health radiating, extremely lush fisherman's wife. I asked to paint her and began working on a watercolor with her being the main subject holding a couple of 6 feet long fish on the beach where the catch was auctioned, packed and sent to London and Paris. The naked slightly red arms clearly inspired the painter most of all". Anders Zorn himself saw this remarkable masterpiece as his ”ultimate accomplishment” as a watercolorist, and in the words of Tor Hedberg: ”From St. Ives stems one of the artist’s very finest watercolors; a beach scene depicting the fish market, the returning fishermen with their catch in the background, and in the foreground a female figure. The artist himself called it his final achievement as a painter in watercolors, and if actually not his last, however, it gives a testimony of his skills. Further than this he could not reach and he could therefor assuredly rest on his laurels”. 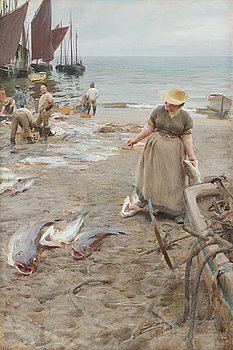 “Fish Market in Saint Ives” has been included in numerous exhibitions, not least internationally, like the Venice Biennale in 1909 and the grand opening of Liljevalchs public art gallery in Stockholm in 1916. The watercolor has also been an obvious inclusion in several exhibitions at the Zorn Museum in Mora, for example: the 50th Anniversary of the Zorn Museum, 1989 and the "Zorn’s Masterpieces" exhibition, 2010. On the international scene the painting has drawn crowds when shown at museums such as the Legion of Honor Museum in San Francisco, 2013-2014; National Academy Museum in New York, 2014, and most recently Petit Palais. Musée des Beaux-Arts de la Ville de Paris, 2017.